A big concern on top of urban transportation planner’s mind is how to speed up the traffic: putting more buses on the road will jam the roads even worse and deteriorate the air; building more subway is costly and time consuming. 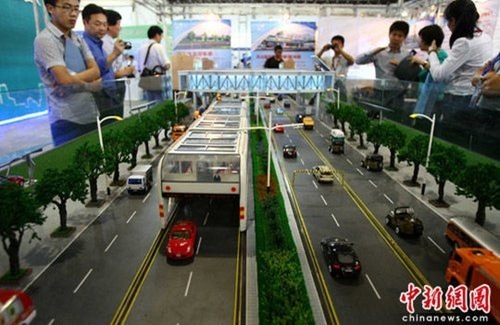 Well, here is an cheaper, greener and fast alternative to lighten their mind up a bit: the straddling bus, first exhibited on the 13th Beijing International High-tech Expo in May this year. In the near future, the model is to be put into pilot use in Beijing’s Mentougou District . Here is the presentation by Song Youzhou, chairman of Shenzhen Hashi Future Parking Equipment Co., Ltd.
“What you can see from the video is traffic jams, what you can hear is noise, and there is also invisible air pollution. At present, there are mainly 4 types of public transits in China: subway, light-rail train, BRT, and normal bus. They have advantages and disadvantages, for example, subway costs a lot and takes long time to build; BRT takes up road spaces and produces noises as well as pollution to the air. How to develop environmental-friendly public transportation? Straddling bus provides a solution. Let’s watch a demonstration.